The goal of the game is to have more disks than your opponent at the end of the game. You can do this by either placing new disks or flipping over the opponent's disks to your own color. Flipping over a disc is done by placing a new disk on the board in a way that the opponent's disc or discs are enclosed by yours. When placing a new disc, you have to place it in a way that it flips over at least one of your opponent's discs. Sometimes you cannot place new discs, because there are no valid locations to place any. In this case, you have to pass, perhaps multiple times. When the board is full and all 64 squares are occupied, or neither players have any valid moves left, the game ends. The winner is the player who has the most disks. 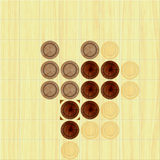 The game features an ELO-like rating system (similar to chess) used on the leaderboards. Changes in rating depend on the score of the actual game and the rating of the computer opponent. The maximum rating difference that counts is 400. This means that you will get the same rating increase against the computer whose rating is better by 400, than against a computer whose rating is better by 600. On the other hand, if your rating is 400 or better than the computer's, no rating will be calculated: you cannot get a better rating, and for practical reasons you also won't lose any, so if you wish to show the game to your friends, you can preserve your rating by setting the difficulty to low. Based on the difference in ratings, there is an expected score for the game, which isn't shown to you during the game itself. If you get a better score than this, your rating will increase; otherwise it will decrease, or in rare cases won't change. The basic score for a game is 1 (if you win), 0.5 (if you draw) or 0 (if you lose). For each undo you use, the score will be decreased by 0.1 - this is the undo penalty. You can lower this undo penalty by achieving 10 Discs through the awards (only three undo discounts at most). Be careful, you can easily lose rating if you use too many undo moves, even if you win! The final rating is based on your and the opponent's rating, and the score of the game. The maximum rating difference that counts is 400. If you play against a computer who is weaker by 400 or more ratings, no rating calculation will be made. You can get awards by unlocking achievements. For each award you get a few Discs, which helps reduce the undo penalty at the rating calculation (see Rating System). Achievements are checked only when the game was finished (neither side can move). When the achievement's description says that you have to win then only 3 undo moves are allowed.